Quick crafts are great but I also love a bit of slow crafting, especially if it’s a portable one that can be done in front of Netflix whilst watching a box set. You see, I’m a bit of a fidget and find it hard to sit still in front of the telly unless I’m doing something with my hands. I think I’ve been conditioned to panic if I’m not multitasking. Watching Netflix and crafting is one of my favourite kinds of multitasking. It’s a win win situation, I get to watch my favourite programmes guilt free as I’m creating something at the same time. Handsewing is a perfect craft for this. Blue is my favourite colour hence the name of this blog. That’s one of the reasons I love working with denim, all those gorgeous shades of indigo. 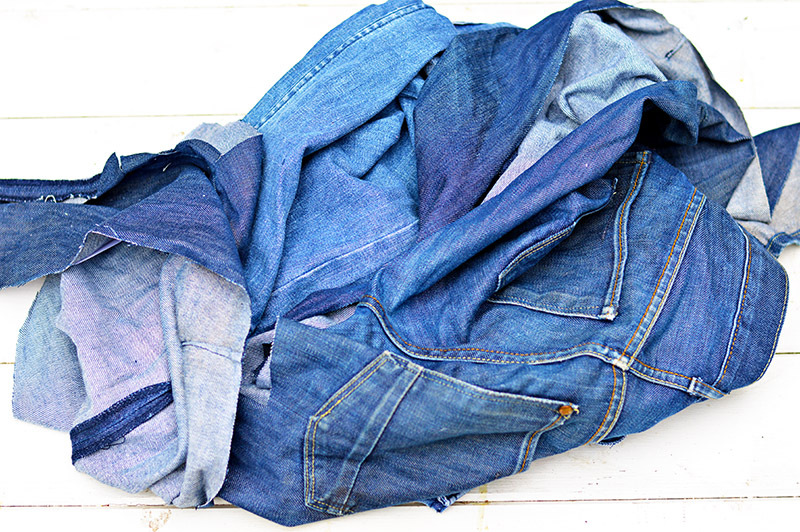 What better way than to show off the great variety of indigo blues you get from jeans than with a denim patchwork. So when I bought some extra chairs for my dining room with seat pads that were crying out for a makeover. It had to be denim patchwork cover. And no I didn’t run out of denim! I consciously decided to break up the denim patchwork with 3 random patches in other coloured fabric. Old jeans – I used denim scraps from a least 3 different pairs of jeans. This was to make sure I had a variety of indigo shades of denim fabric. There are many great guides and videos to English paper piecing patchwork on the internet such as the sewing directory and you tube videos. I will still show you how I did it. For this denim patchwork, everything was hand sewn however if you want to, some bits can be machine sewn. The first thing to do is to cut out your hexagon shapes. 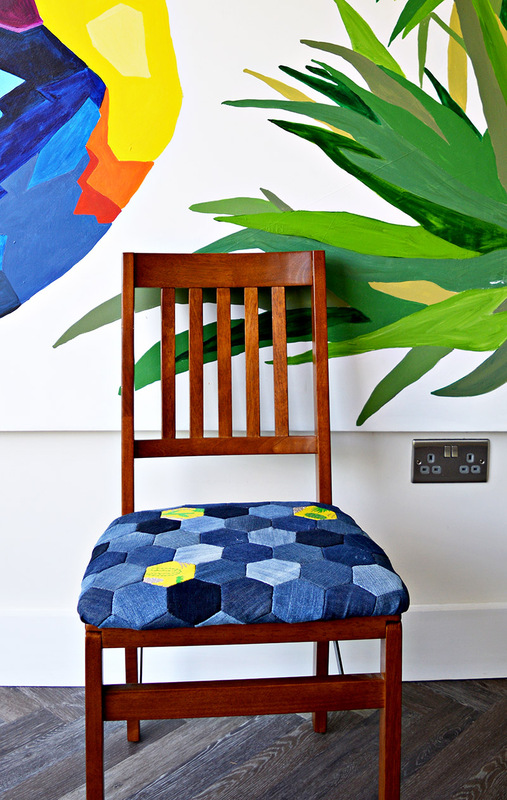 Using the double back sticky tape, tape a paper hexagon to the denim. Then using the rotary cutter cut out your hexagon shape leaving a 1/4″ seam allowance. Carry on until you have enough hexagons to cover your seat pad. As well as the denim hexagons I cut out 3 fabric hexagons from my fabric scraps box. 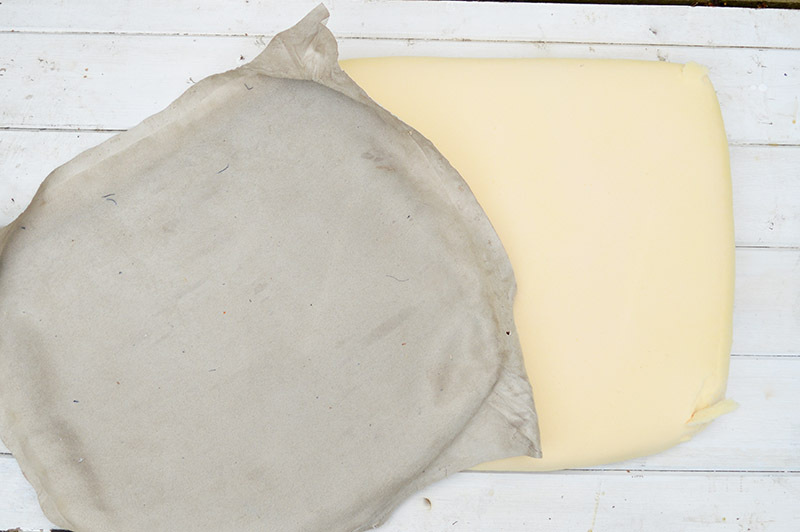 Take one denim hexagon and fold over the seam allowance over the edge of the paper. Using a needle and thread hand sew your hexagons in place with a tacking stitch. (I do this without actually going through the paper hexagon). Repeat with all the remaining hexagon denim cut-outs. 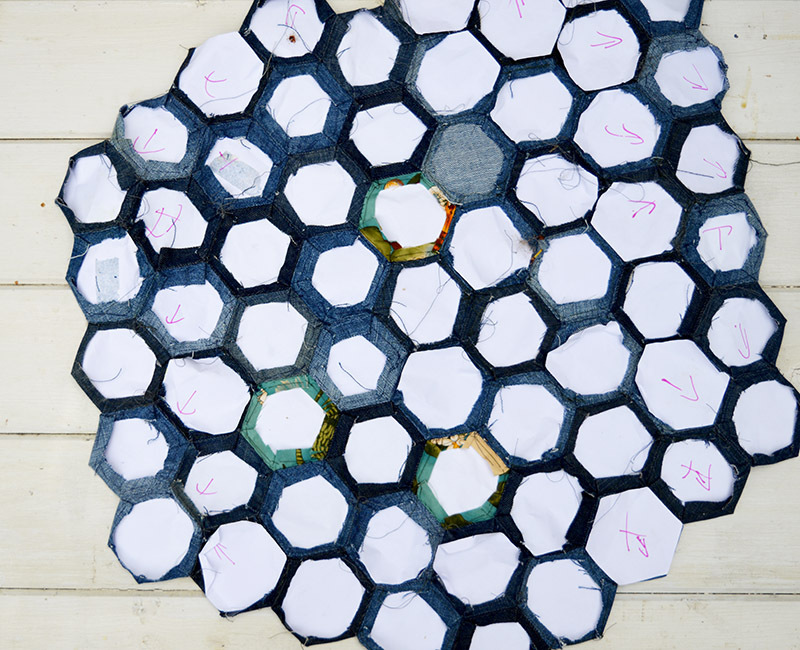 Next iron all the individual denim hexagons flat. 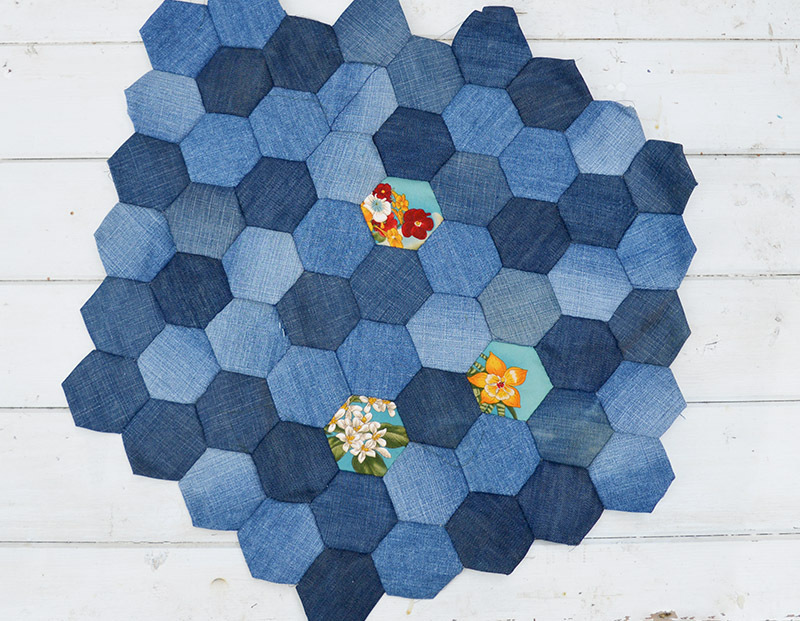 Gather the flat denim hexagons and sew them together one by one. Place two hexagons right sides together and using a running stitch sew them together along the top edge avoiding the paper. Some people like to stitch the hexagons together into a flower pattern or in rows and then join the rows. I however just stitched them randomly together in no particular order. The reason I did this is I wanted to achieve a random effect with the different tones of denim. I also added my 3 fabric hexagons in randomly. 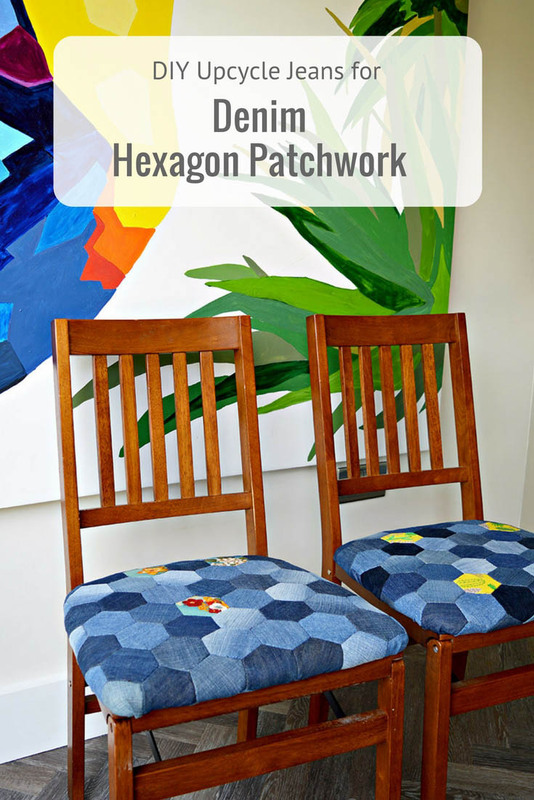 Continue stitching your hexagons together until you have a piece that is large enough to cover your seat pad. Cut off all the loose threads and then turn your patchwork denim fabric over to remove all of the paper hexagons. Unscrew the seat pad from the chair and remove the existing cover. This will probably involve removing lots of staples from the underside of the seat. 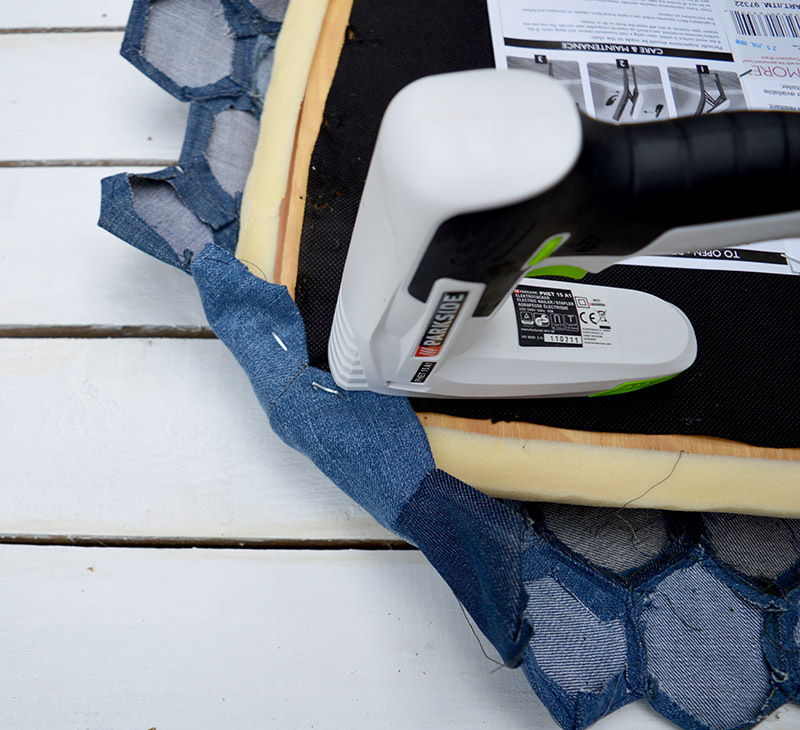 Place the denim patchwork on the top of the seat pad. Then turn it over and whilst pulling the patchwork tight staple it to the frame of the seat pad. I normally start with the four corners and then work my way round. To ensure a snug fit use a lot of staples all around the edge. Finally, screw the seat pad back onto the chair frame. So far I have made two patchwork denim seat covers and have another two to go. 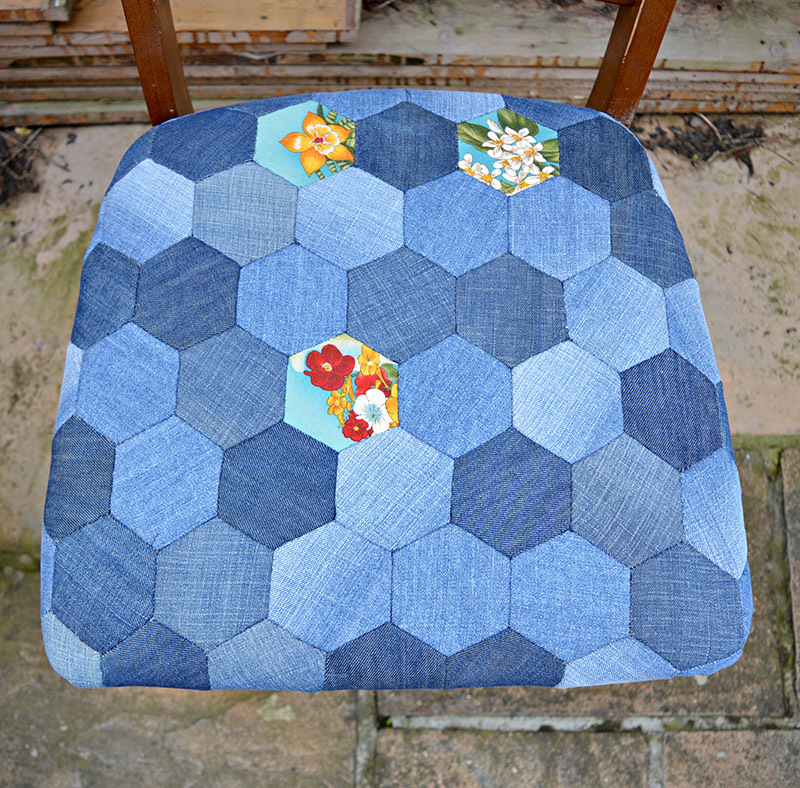 I love how they have turned out, the hexagon patchwork really highlights the different tones of denim. 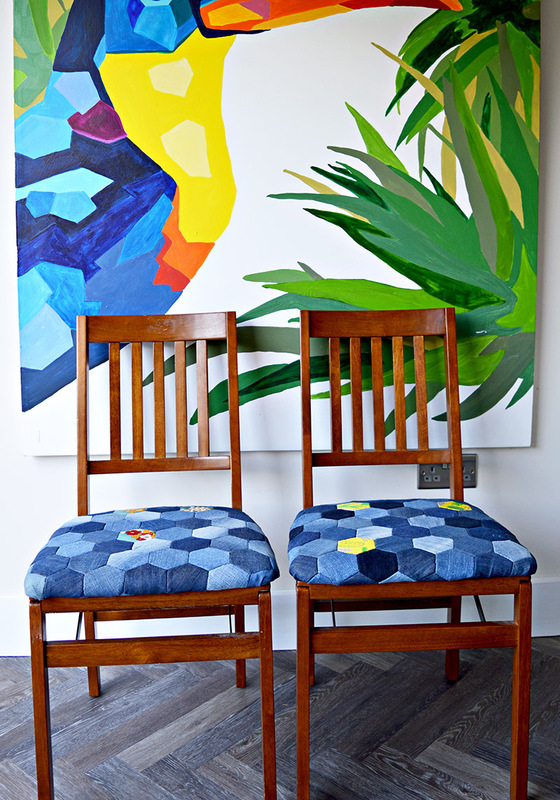 I also love how the 3 random hexagons of coloured fabric will make every chair slightly different. The hand sewing has made the end result worthwhile. If you don’t have the patience for hand sewing your hexagons together there is a tutorial for machine sewing them on youtube. However, I think the hand stitched hexagons look better. Personally, I can’t decide which chair is my favourite the yellow or the blue. I think though I will look for some fabric scraps with a green in them for the random hexagons on my next chair pad cover. If you haven’t tried English Paper piecing ago and are tempted to try it. 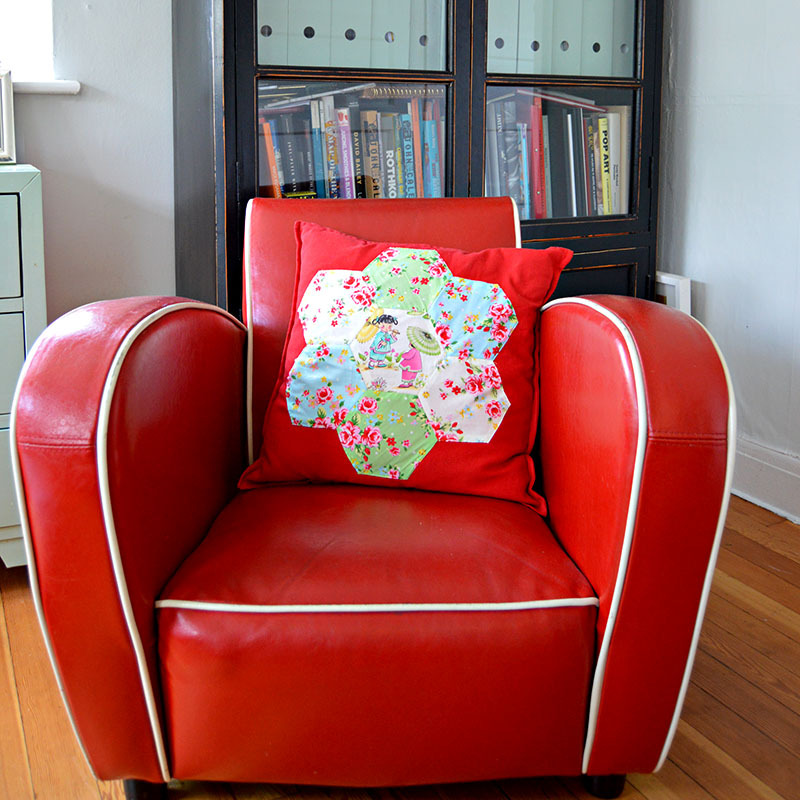 You may want to try with an easier project such as my Chinese applique patchwork cushion/pillow. Or you may want to check out my other denim upholstery tutorials. Thank you, I love crafting new life back into the old. Wow! I love denim crafts, and this is just a wonderful denim creation. Now, I’m thinking about all the old jeans I have laying around. Great work!! I admire your creativity! Pinning! Thank you T’onna, I just love crafting in denim. This is a real great upcycle Clair. Those chairs would be so perfect in a boys room. I usually have something to do when the television is on, usually crochet or needlepoint. This is a great idea. Thanks for sharing. Thank you, my crochet is a bit wobbly at the moment and requires too much concentration so I stick to the needlework in front of the telly. Thank you, at least sewing or crocheting is more productive than playing on my phone whilst watching telly. While watching tv I fidget also but not in a productive way. Most of the time I’m on my phone playing solitaire. These chairs look very expensive and I’d love to have just a few ounce of your creativity and patience. The three different hexagons on each chair are really striking. Great Job! Thank you for sharing with us at Celebrate Your Story, and I hope you’re having a great weekend. Thank you, I often waste time on my phone while watching tv so it was fun to actually do something creative for once. Great upcycle of old blue jeans Claire, love it! Thanks for sharing this at the Dishing It & Digging It Link party. 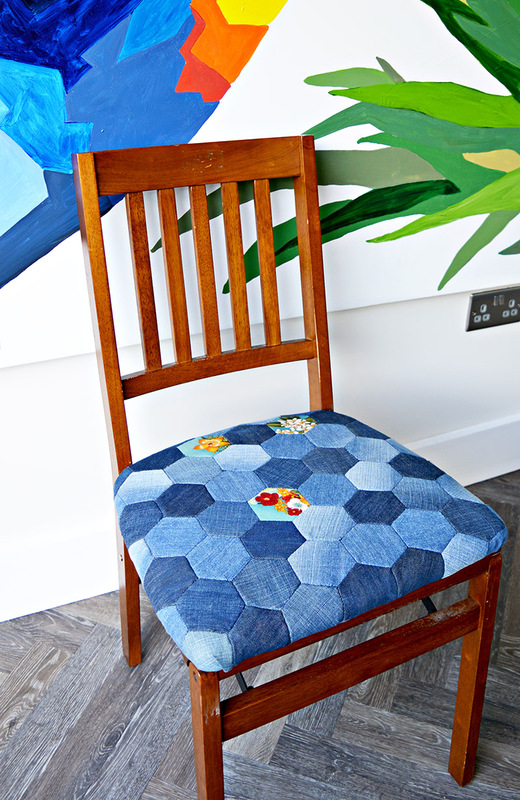 I LOVE your denim hexie chairs, Claire!!! Such a great way to have different coloured denims in the one project. I love hand sewing hexies – I’m making a quilt at the moment. Now I have an idea for a future hexie project once my quilt is finished. Thank you Pam, I have a denim quilt but it’s not a hexie patchwork. I have fallen in love with hexies though so I’m looking for my next hexie project. Your chairs turned out so nice. Very creative makeover. Thanks Vicky, it was pretty easy to make and I did enjoy doing it, I want to do some more. These are so fun, Claire! Love the floral accents, too! Pinned–thanks for sharing @Vintage Charm! Thank you, I couldn’t resist an extra splash of colour. These are great. I love the different colors of denim and the splashes of color. Thanks for sharing on the Waste Less Wednesday blog hop! I love how your chairs have turned out! I too enjoy crafting and watching TV – it certainly helps me feel settled while sitting. Thank you, yes crafting in front of the tv is very relaxing. I’m exactly the same Claire, I feel totally guilt free watching tv as long as I have a craft on the go too. Thank you, Julie. I have patchwork denim quilt I made years ago which is still on my bed and I love it. So I wouldn’t give up on the quilt idea if I was you. What a great idea! I love the makeover you did. Claire, I absolutely love denim in home decor, my goal is to have an upholstered wingback chair in denim one day, your project came out adorable I really love it! 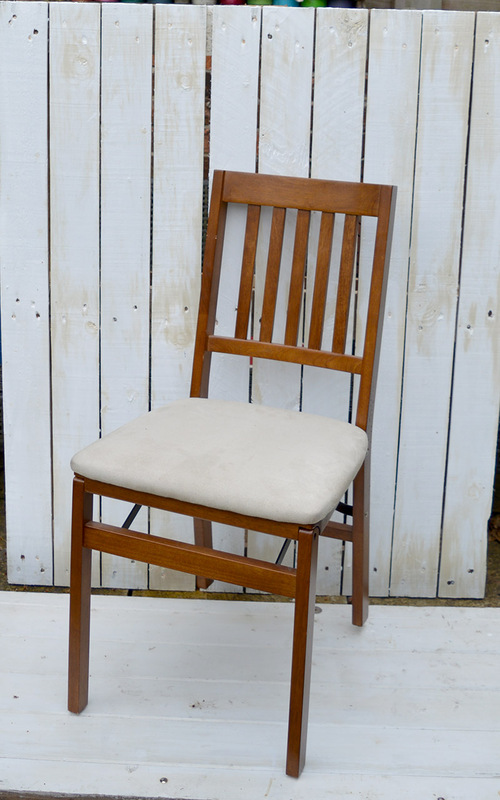 Thanks so much for sharing it at #FridaysFurnitureFix. A winged back chair sounds awesome I’d love one too! Thank you. That looks great!! What a fun way to use old jeans – Thanks for sharing on the Pleasures of the NW’s DIY party! I love denim, too! I love how your chair pads turned out. Thank you, I love all the different shades of denim together. Thank you, I think these long projects are more satisfying when they are finished knowing the loving work you have put into them. Claire!! The patience you must have to see this through is beyond my comprehension, lol. But I can see it was totally worth it!!! Thank you, some projects are worth the extra effort like this one. Thank you, Lynda. Netflix is a great crafting accompaniment. Thank you so much, Lisa, I just love working with denim. Oh Claire, I just love this! You did such an amazing job on it wow! I love the three different patterned patches too. I would buy those chairs in a flash! Thank you so much Carolann, I do,like how they turned out I’ve just got to finish the next 2. Claire did you watch all 13 seasons of Grey’s Anatomy while doing those patchwork chairs? And all hand sewn! Respect to Claire!! They came out great and so unique! And what were you watching on Netflix? Thank you Mary, I have watched all 13 seasons of Grey’s but that was another craft. I watched the latest season of Sense8, whilst doing these chairs. I’ve still got another 2 chairs to go so if you have any recommendations I’m looking for another Netflix series. I wouldn’t say I have the patience of a saint but I did enjoy just sitting down and crafting all day on a wet Saturday whilst binging on Netflix.